This is another well-known dish, originally from Europe, but very popular in Mexico as in many other places; it may be included as part of a menu, or just as a full meal with a side of potatoes, or a salad. Meatloaf is also known in Spanish as albondigón – big meatball, and some regional recipes, particularly in Southern Mexico, require onerous steps, such as cooking the large piece of ground meat by frying in lard, or steaming; stuffing with elaborate preparations; and coating in sauce, usually tomato based. I am sure I will take the opportunity to explore some of those recipes soon, but this time I am presenting two simple versions, baked in the oven: the more traditional recipe, which includes bread, milk, and bacon, and a “light” version I just developed, without those ingredients, suitable for people who avoid pork, or with intolerances to gluten and lactose. They are both delicious, and sure to please any meat lover. Each recipe is enough for six portions. About hard-boiled eggs: A good way to avoid the grey ring around the egg yolks in hard-boiled eggs, is to prevent overcooking. I try to place raw eggs at room temperature in a pan with enough tap water to cover the eggs over by one inch, then bringing to a vigorous rolling boil over high heat; I remove the pan from the heat and let rest, covered, for nine minutes*. After this time, I place the pan under running tap water to slowly cool the water in the pan, along with the eggs; cooling the eggs seems to loosen up the membrane between the egg white and the shell, allowing easy peeling, without shell shards adhering to the egg. * Note: for my region’s low elevation of 190 m (623.4 ft) above sea level, water boils very close to its sea-level boiling point of 100°C (212°F), but for every increase in altitude of 150 m (500 ft.), the boiling point of water decreases by 1°F. At high altitudes, longer cooking times will be required to adjust for this change. For example, in Mexico City, an elevation of 2,250 meters (7,377 ft.) causes water to boil at only 92°C (198°F); I remember my mom leaving the boiled eggs resting in the pan with hot water for any length of time, even sometimes until they reached room temperature, with no dramatic consequences, colour wise. I am joining Fiesta Friday #259 with Angie @ Fiesta Friday, this week with co-hosts Ai @ Ai Made It For You and Jhuls @ The Not So Creative Cook. Thank you so much to Helen @ The Lazy Gastronome for featuring my Stuffed Pork Chops recipe in her What’s for Dinner? Sunday Link-Up # 184! 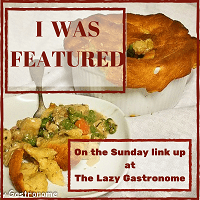 I am joining with these meatloaves, a great dinner option for Sunday or any day of the week. This sounds so delicious! Thank you for making the light recipe. Cooking today, inspired by you! Thank you, Victoria! Let me know if you got to try it. Hee hee, please let me know how you liked it, thank you Tracy! I will Irene. It won’t be for a while though. It is too hot at the moment to use the oven. I will look out for it, Irene. I’ve never seen that kind of meatloaf. It looks fun, like Cyclops. Hee hee, yes, maybe they could be part of a “Minions” theme party! I know you are not eating a lot of meat these days, but the second recipe is gluten and lactose free, with apples and onions instead of bread and milk. oh, a Minions party! that sounds like a fun theme. I do think the apples and onions sound better. Mostly cuz apples let me sneak a little sweetness into my eating style. This sounds so tasty. I love the boiled eggs in the middle. 😀 Thanks for sharing & happy Fiesta Friday! Thank you for your kind comment, Jhuls! Thank you for your feedback, Ai, I hope you like it! Hello Irene, thank you for sharing this. They look so good…we love meatloaf at home. I will try this soon. Have a wonderful week. Thank you, MarEliz, I hope you like them; have a great week, too! This is a PERFECT set of recipes for me! I am on a very low carb diet for medical reasons and both of these fit the bill AND are a comfort food for me. WIN! WIN!! I am so glad they are suitable for your restrictions, I hope you like them! I love the eggs in this. Does the apple change the flavor much? Thanks for sharing at the What’s for Dinner party! It is a tad sweeter, although I think the grated onion is the big flavour changer in the recipe (in a good way); the texture, though, is lighter and very moist. Have a great week, Helen! Wow meatloaf heaven. Thanks for sharing at fiesta friday. Sharing….